Definition/Description: Summarizing is often used in reciprocal teaching, however it is a very effective research based strategy on its own. In summarizing student are asked to recap the main ideas of a text in your own words. which is also called the gist. Students determine what the main detail are such as who, what, setting, and events that might have happened and instead of right word for word what happen in the story, text, or chapter students decided what is the most important and write it in their own words. The teacher in this video describes what summarizing is and how to use sum it up for two dollars as an activity of how to sum the story up. This is when every word a student writes cost ten cents and they only have two dollars (twenty words). This teaches students how to summarize a large reading/text into few words. I like this strategy and think it is a good one to use with students. ​This graphic organizer is one example of a way students can "lay out" their information so they can get all the main detail in a certain lesson or reading. This helps struggling readers determine what is important in including in a summary, such as who, what, when, where, and why, the five W questions. 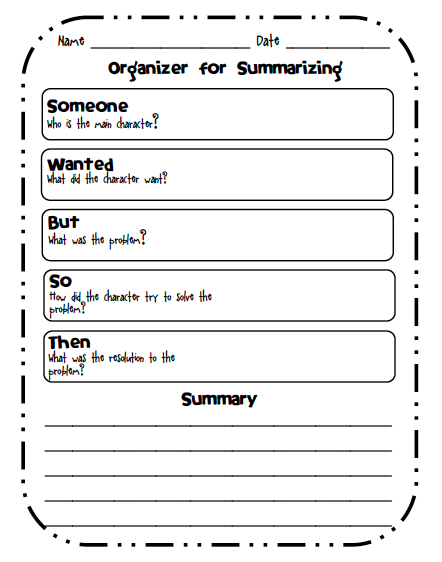 There are so many resources out there for one to find to help their students with the summarizing strategy. ​Justification: The reason teachers use summarizing is to help students “focus on the heart of the matter” (Jones, 2007). Teachers want their students to capture the main message or idea, and often comprehending is hard for struggling readers. However using this strategy will help students be accountable for recalling what the story was about and sharing what they believe it was about. Research done by Block and Parris, states what comprehension strategies should be taught, how, and why. It states that every year students need to learn, recap, and use 45 different strategies for reading and reading comprehension. One of those is summarizing, because we (teachers) need to use strategies that allow students to understand he content and promote their thinking. This research also stress the importance of teachers understanding how to teach, model, and scaffold this strategy as well as any reading comprehension strategy (Block and Parris, 2008).The reason we use summarizing as a reading comprehension strategy is because we want students to pull out main ideas of the text, focus on specific details that make the text make sense. Even though summarizing is typically written, it can also be used orally and visually, which can help those struggling readers who have a hard time with spelling and witting (Miller and Vetch, 2011). Helping struggling readers break down a text and see little sections make a whole story it will help them comprehend and hopefully start to enjoy reading a little more! During and after a story. Example: The picture to the right is demonstrating how to use the strategy summarizing to organizer events in a story (Into the book, 2015). How to solve a problem. Field trip, to state capital, etc. History event, current news, etc. Block, C., C. & Parris, S., R. (2008). Comprehension Instruction, Second Edition: Research-Based Best Practices. Guilford Press. ​Miller, M., & Veatch, N. (2011). Literacy in Context (LinC): Choosing Instructional Strategies to Teach Reading in Content Areas for Students Grades 5-12. Pearson.